[6:10:51 PM] Thuan Thi Do: In the course of investigating some thousands of human beings, traces of such intervention were found in only in a few. The most prominent instance is that ( Page 305 ) given in the twenty-ninth life of Alcyone, when he pledged himself to the Lord Buddha to devote himself in future lives to the attainment of the Buddhahood in order to help humanity. This being a promise for the far-distant future, it was obvious that the personality, through which it was given, could by no means keep it. Investigation revealed that even the ego, though full of enthusiasm at the idea, was being impelled by a mightier force from within which , he could not have resisted, even had he wished to do so. Following the clue still further, it was found that the impelling force came forth unmistakably from the Monad. He had decided, and he registered his decision. His will, working through the ego, will clearly have no difficulty in bringing all future personalities into harmony with his great intention. Other examples of the same phenomenon were found. Certain Monads had already responded to the call of the higher Authorities, and had decided that their representative personalities should assist in the work of the Sixth Root Race in California, some hundreds of years hence. Because of that decision nothing that these personalities might do during the intervening time could possibly interfere with the carrying out of that decision. The compelling force is thus not from without, but from within, from the real man himself. When the Monad has decided, the thing will be done, and it is well for the personality to yield gracefully and readily, recognising the voice from above, and co-operating gladly. If he does not do this, then he will lay up for himself much useless suffering. It is always the man himself who is doing this thing; and he, in the personality has to realise that the ego is himself, and he has for the moment to take it for granted that the Monad is still more himself—the final and greatest expression, of him. In view of the general consideration that in a perfectly ordered universe there is no room for chance, it seems probable that the very mode of individualisation, from the animal kingdom was somehow predetermined, either for or by the Monad himself, with a view to preparation for whatever portion of the great work he is to undertake in the future. For there will come a time when we shall all be part of the great Heavenly Man: not in the least as a myth or a poetic symbol, but as a vivid and actual fact, which certain investigators have themselves seen. That celestial body has many members ; each of these members has its own function to fulfil, and the living cells which are to form part of them need widely different experiences to prepare them. It may well be that, from the dawn of evolution, the parts have been chosen, that each Monad has his destined line of evolution, and his freedom of action is concerned chiefly with the rate at which he shall move along that line. In the Celebration of the Holy Eucharist, there is a good deal of symbolism concerned with the Monad, the Ego and the Personality. Briefly speaking first of the Three Persons of the Trinity, the Host typifies God the Father, and also stands for the Deity, whole and indivisible; the Wine stands for God the Son , Whose life is poured down into the chalice of material form ; the Water represents God the Holy Ghost, the Spirit Who brooded over the face of the waters , and yet at the same time is Himself symbolised by water. 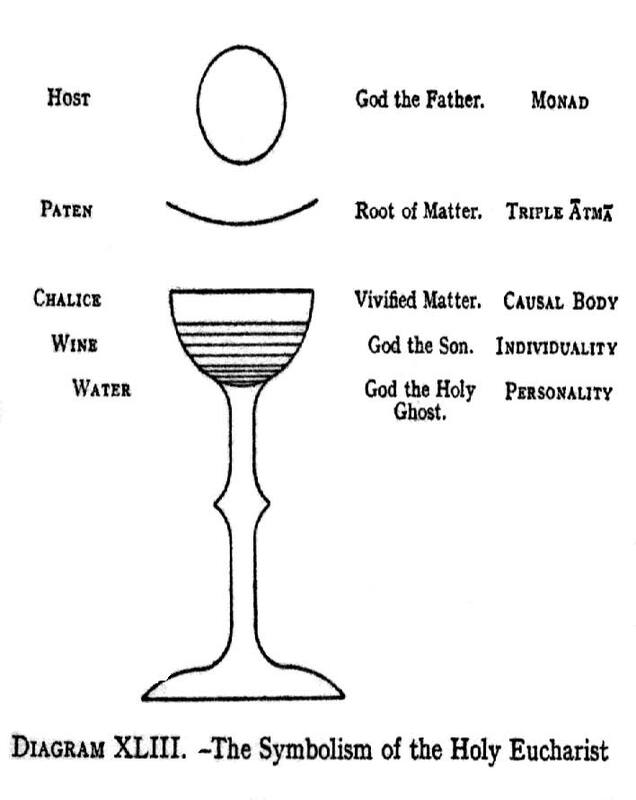 Speaking next of the Deity in man, the Host signifies the Monad, the totality, the unseen cause ofall: the paten means the Triple Âtma or Spirit through which the Monad acts on matter : the Wine indicates ( Page 307 )the individuality, poured into the chalice of the causal body : the Water represents the personality which is so intimately mixed with it. Passing to the effect of Communion upon the communicant, the force of the Host is essentially Monadic, and acts most powerfully upon whatever within the man represents the direct action of the Monad : the force of the Chalice is more that of the ego : the Wine has a very powerful force upon the higher astral levels, and the Water sends out even etheric vibrations. 1. A chain has seven globes. 2. The life wave of each chain goes around the globes in seven rounds. 3. Each globe has seven root rates. Thus each round will have 49 root races, and for the 7 rounds around the chain there will be 343 root races (assuming that all the globes also have root races). 4. When the life waves moves from one globe to the next, such a globe will be in "obscuration" and only the Sishtas or life seeds remain. 5. Life in the six globes will be non-physical. Only the 4th globe is physical. 6. My understanding is that the life in the higher globes is analogous to the after-death states, hence are non-physical. In the same way that we go through changes in the after-life state (and in that sense evolve) so do we change and evolve even in the non-physical globes. Change and improvement does not always have to be in the physical body or physical plane. I trust that the above are helpful.